Once you have created your account as well as a character you are ready to play. 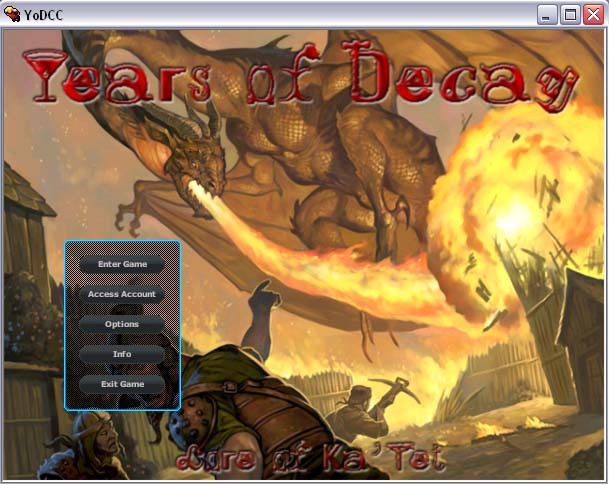 To start playing Years of Decay, double-click on the desktop icon. You will now be taken to the title screen. Clicking on this button will take you into the game. Before you can start playing, however, you must enter your account number and password. If the data you have entered is correct, a list will appear in which you will see the names of all your characters. Select the character you would like to play with and click on "Ok". Please note that if too many players are online you will have to wait a while before you can log in. The client will show your current position in the login queue and automatically try to log in your character after the displayed waiting period. Create an account now if you have not done it yet to become part of this great game. Clicking on this button will take you to your account page. For details please see the manual section on accounts. Click on this button to enter the "Options" menu. Most of the buttons displayed here will open further submenus where you can change a number of game options to customise the client to your taste. For a comprehensive list of all game options see the manual section on game options. 2 buttons are different, however: the one labelled "Hotkeys" does not open up an options menu. Instead it will open up a dialog in which you can assign customised messages to hotkeys. The second button is labelled "MotD", which is an abbreviation for "Message of the Day". Clicking on this button will display any daily server message. Note, however, that you must have logged into the game before any message will be displayed here. Click on this button to learn some general information on Years of Decay as well as on the client you are currently using. Also, you will find a button here that will take you to the Year of Decay's official website yod.wikidot.com. The adventure screen is the main view of the game world during play. The general layout of the adventure screen cannot be modified, although some components can be moved around (automap, inventory, status bars and buttons) or modified in size (game window, console). The game window takes up the main part of the adventure screen. Almost all game play takes place on this window - you will see other characters moving about, approaching monsters, items on the floor and, of course, the surrounding countryside. Your character will always be in the centre of the game window. It is possible to modify the size of the game window. If you do so, the console will increase or decrease in size accordingly. To change the size of the game window left-click on the top bar of the console and move your mouse up or down, keeping the left mouse button pressed. Similar to a radar screen, the automap shows a bird's-eye view of your surroundings. It is essentially a miniature version of the game window, although it covers a much wider area. 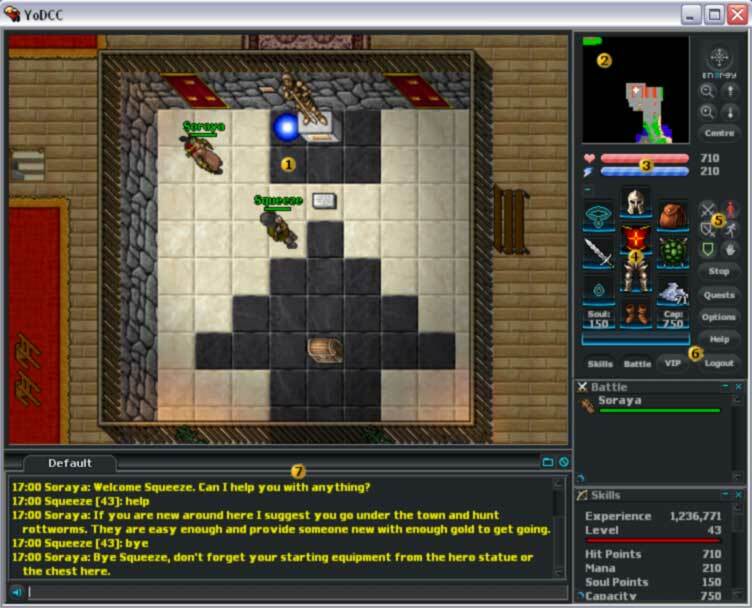 Like the game window, the automap is centred on your character, which is shown as a black or white cross, and just like in the game window, you can move your character by left-clicking on a spot on the automap. There are 2 important differences to the game window, however. Firstly, unexplored areas in the automap are covered by black fog that keeps you from seeing what might be hidden there. Secondly, it is possible to mark places of interest on the automap. To set a mark right-click onto a spot on the map and select "Set Mark" from the context menu. If there is already a mark on the selected spot you can choose to edit or to delete it. If you set or edit a mark you can select an icon of your choice and enter a short description. To the right of the automap you can see a compass rose as well as a number of buttons. These icons are designed to scroll the automap in all directions, including higher and lower floors. These 2 bars show the condition of your characters' most important attributes: their health (red) and their mana, i.e. their magical energy (blue). The bars will show the current state of these attributes in relation to their respective maximums, while the numbers behind the bars will show the actual amount of hit points and mana points your character has. There are several ways to restore hit points and mana points. For details please see the manual section on characters. This part of the adventure screen shows your characters' equipment. You will see a portrait of the active character's body, split up into a number of individual slots. These slots represent the locations where items can be equipped - there is one slot for your character's head, one for the torso, 2 for the hands etc. To equip an item simply move it into the slot it is intended for. Please note that items will only be useful when they are placed in the slots they are designed for. You can place a shield in the belt slot, but it will not protect you there! Also, placing items in slots they are not designed for will often be impossible. For example, you cannot place a sword in your character's head slot. If you feel you don't need to see your inventory for a while, you can minimise it by clicking on the button in the top left hand corner. Armour Slots: These 4 slots cover your character's feet, legs, torso and head. They are reserved for clothing and armour. Hand Slots: You can place almost any item in your hands as long as you are strong enough to carry it. However, you will usually carry a weapon and a shield or a single 2-handed weapon in your hands. It does not matter in which hand you place the weapon - all characters are perfectly ambidextrous. Amulet Slot: You can place a necklace or an amulet in this slot. Ring Slot: This slot is reserved for rings. Container Slot: You can place containers such as bags or backpacks in this slot. Belt Slot: This slot can be used to store items which you need to have close at hand. It is no coincidence there is an arrow symbol in this slot - if you are using a bow or a crossbow, you have to place your ammunition here. On the other hand, if you are using a melee weapon and a shield, this is a great place to equip a torch. The field in the bottom left hand corner shows your amount of soul points. Characters have a maximum of 150 soul points while promoted characters have a maximum amount of 250. Your amount of soul points is reduced whenever you cast a rune spell or certain other spells which are used to magically generate items such as ammunition or food. Soul points fill up if you receive experience points that equal or are above your character's level for killing one monster, or by sleeping in a bed. The small field in the bottom right hand corner of the inventory shows your current capacity. If you try to pick up an item whose weight exceeds your capacity, you will receive an error message. You can check an item's weight by looking at it. The oblong field at the bottom of the inventory will tell you if your character is suffering from a special condition. The nature of the condition is indicated by a corresponding symbol. Special conditions include poisoning and burning as well as the logout block and speed sign as shown in the image above. For a comprehensive list of all special conditions please see the manual section on characters. To the right of the inventory you can see a set of 6 buttons. The three buttons to the left serve to set the combat mode. How daring do you want your character to be? Characters that are set to offensive combat mode will storm into battle, concentrating all their skill on an all-out attack. Because of this they receive a bonus to their attacks. However, the drawback of such reckless fighting is that a character's defence is reduced as long as he is set to offensive combat mode. The buttons to the right will determine your character's automatic movement during combat. This is the default movement mode. Characters that are set to this mode will try to make a stand where they are. They will not budge unless they are pushed aside or until the player moves them manually. Characters that are set to "Chase Opponent" will try to corner their opponents. Whenever a target is attacked such characters will try to move as close as possible towards it, taking the shortest way possible. If you are not happy about the way a character is moving, you can easily stop him by clicking on "Stand while fighting" or by moving him using the mouse or the cursor keys. However, note that if "Auto Chase Off" is disabled in the game options, your character will resume with the movement mode "Chase Opponent" once you take the finger from the cursor key. The third button to the right serves as a security switch to avoid unwanted attacks on other characters. You can use it to switch between secure and normal mode. This is the default setting. Characters set to secure mode cannot attack other characters. This way it is not possible to attack innocent bystanders or friends by accident. Note that you can always defend yourself against attacks in this mode because aggressors will be marked automatically. Also, keep in mind that the secure mode will not prevent that your character may get a skull mark if he causes damage, e.g. by fire fields or explosions. If this mode is activated you can freely attack all other characters. Keep in mind, however, that your character will receive a skull mark if you attack unmarked characters. In addition to the combat controls a number of further control buttons are arranged around the inventory. The "Stop" button will cause your characters to stop whatever action they are currently taking. As a shortcut you can also hit the Esc key to stop your character. If you click on this button, your quest log will open up. Here you can check quests that your character has started or already completed. To find out more about this feature, read the section about the quest log. Clicking on this button will open up the game options menu. This menu can also be opened on the title screen. For a comprehensive list of all game options in Years of Decay see the section on game options. If you have a question or a problem, you can click on this button to get help. A special help menu will open up from which you can select whatever kind of support you need. The first 4 buttons (client help, tutorial hints, tutor help, rule violation report) will help you to get in-game support, while the last 2 buttons will refer you to the help sections of our website. For further information on how to get help in the game please see the section on in-game support. To leave Years of Decay you should use this button. Unless your character is barred from logging out by a logout block clicking here will take you back to the title screen where your character list will be displayed, so you can easily log in again. The character list will close after 30 seconds due to security reasons if you do not log into the game again. Even though it is possible to shut down the client anytime you should keep in mind that it is possible that your character will stay in the game due to the logout block. The same is possible if you get disconnected from the game server. Also, please note that characters log out automatically if they have been idle for sixteen minutes, i.e. if no action whatsoever is performed during this time. If a character has been idle for 15 minutes, a red message will be displayed which will warn players of the imminent logout. Clicking on this button will open up the VIP list ("Very Important People"). You can add up to 20 characters to this list and premium players even up to 100. This is a very useful feature, because by looking on the VIP list you will always know when your friends and enemies are online. For further information on the VIP list please see the section on player communication. Use this button to open the battle list. In this window you will see a list of all characters and monsters that are currently within battle range. The list includes a miniature version of the character, his health status bar and possibly a skull mark. You will find the battle list is very useful because you can direct your attacks and even your spells through it. A click on this button will open up a subwindow that will show you all you need to know about your character. Among other things, this list contains your character's experience, level, hit points, mana, magic level and skills. The character's current experience and skill levels are indicated by the numbers to the right, while the progress to future skill advancements is indicated by little bars. To receive more detailed information on your progress in a skill place the mouse pointer on the corresponding bar and wait for the tool tip to open. The tool tip will show your progress in per cent. Also, it is possible to hide specific or all skill bars in the skill window. To do so right-click on the window and select the skill bars you would like to hide. For details please see the manual section on characters. The console is reserved for communication with other players. It consists of an area where all messages are logged as well as an entry line in which you can compose messages yourself. The console is usually set to the default channel in which you can talk to nearby characters. There are further channels available, though, which will allow you to chat with people who are far away. You can recognise these channels by the labelled tabs. To switch between channels use the "Tab" key or click on the tab of the channel you would like to use. For further information on the console and on chatting in general please see the manual section on player communication.